With the best start to a season behind us, October approached having already seen our first big females and recorded more sharks at this point than ever before………could we keep this average up we asked?…………October did not let us down…………. 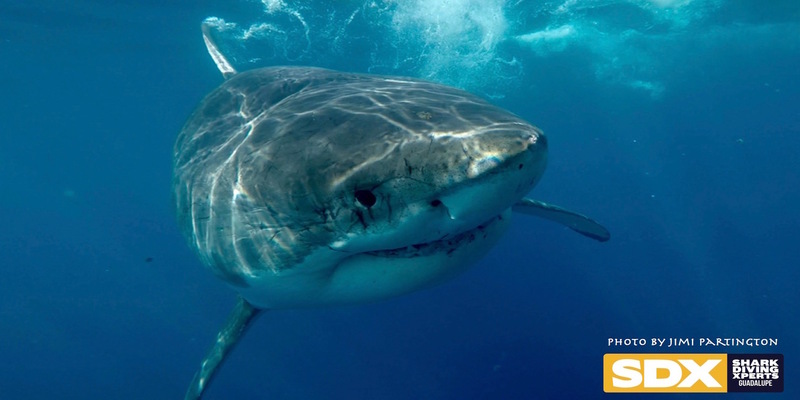 Typically as September moves into October the weather begins to cool and the number of sharks goes down slightly but to make up for this, we begin to see increasing numbers of the famous “Mega” sharks! “Dotty’” and “Tzitzimitl” (two of the islands classic females) had already been seen in the last week of September so the team wondered which other big girls where soon to turn up…..
Trip 5 got of to an amazing start…as soon as we had dropped anchor “Dotty” was waiting for us giving our guests the most incredible start to a trip! It didn’t stop there as mid afternoon saw the arrival of big “Tzitzimitl” completely spoiling our divers for a first day of diving! At first light of trip number 6 another huge shark we know well, “Scarboard” turned up and completely stole the show (see below) and throughout trips 7 and 8 we continued to encounter her as well as “Lucy” (possibly our most well know female white shark encountered at Guadalupe). Although we where still getting regular visits from our younger well known males throughout the month, it seems October belonged to the Big females…. During 2015 we hosted the group Sportsmen for Warriors, a charity group who reward war veterans from the united states with outdoor activities to bond and bring together these brave and deserved warriors. The trip was such a success last year that this year trip number 7 was another charter from the same group. To host this group of individuals is a privilege and the warriors where treated to some amazing action as well as visits from our big females……. As mentioned above, trip number 6 saw the arrival of one of Guadalupe Islands famous big females, “Scarboard”. This shark has been seen out here for many seasons now and is simply immense. At 18ft in length and incredibly girthy, she is the biggest shark seen this season to date. She was originally named after the scars that cover her right side however these days her whole body is completely covered in scars making her look almost prehistoric! She works the baits well and completely takes over the scene when she turns up to the boat. Although we have seen this shark for a number of past seasons, this year she has really made a name for herself and if her apperances continue, she could easily be crowned Guadalupe shark of the year! As we begin to move into November we will see the end of our regular trips and begin to host private charters as well as research trips………..lets hope the season has not yet peaked…….bring on November!